If you're a Remote Technical Support customer, we're repeating our information about our new software. If you already have it, you can zip past that information! Please be sure to read our Question of the Week below! It's all about Social Media! If you're a Remote Technical Support customer, we are changing to new software. 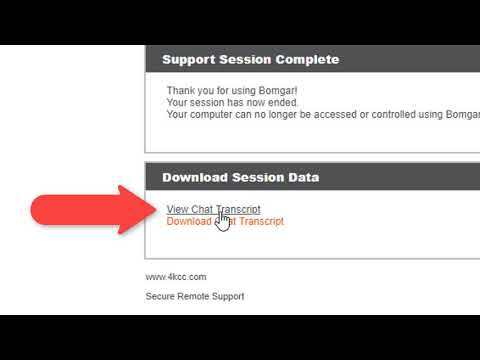 If you have our old software (4KCC Remote Support icon), you can log in at your convenience and we will install the new software for you. We will also remove the old software. 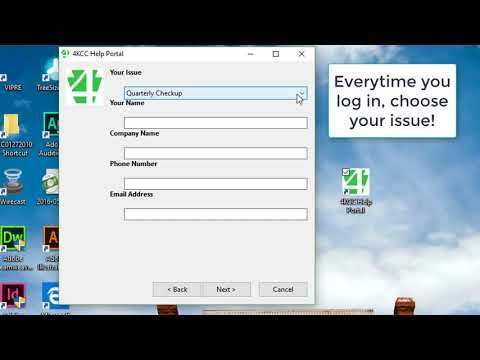 Once the software is installed, when you go to log in to us during regular hours, double-click the icon labeled "4KCC Help Portal." When the software starts up, you will get a window with two choices. Do NOT click on "Enter a Session Key." Instead, click on "Describe your issue." When you do, another window appears. There's a drop-down menu at the top. Click and choose the reason you're logging in. We need you to choose a reason every time you log in. Then, type your name, phone number and email address. Finally, click "Next" and you'll be connected to us! Once connected, in most cases, you will need to click YES on the permission window which will appear. We have a video showing this and you can click on it below to see how it works. When you log off of our new software, a browser window will open and a pop-up will appear. If you want to see if we left you any messages, be sure to click on "View Chat Log." We have a video showing this procedure as well - just click on it below. If you aren't a RTS customer and need help, you can go to support.4kcc.com and follow the instructions to open a chat with us and allow us to log on to your machine, if needed. Hopefully, you'll decide to join the RTS program! Question: "I finally got started in Social Media. I'm using Facebook and Instagram. I have a lot to learn but I would like to ask this question: do celebrities actually post their own things? And, will they interact with me if I follow them?" Answer: The world of Social Media can be fun, exciting, uplifting and encouraging. Unfortunately, it can also be depressing, addictive and upsetting. I warn everyone who uses Social Media: take breaks every once in a while; follow uplifting people and not those who spread negativity; don't be afraid to block someone who becomes aggressive or nasty towards you. And, especially for women and children: don't reveal too much about yourself to people you don't personally know. As for celebrities, it's that familiar Microsoft Answer - it depends! Addressing the first part of this week's Question: some celebrities run their own social media accounts while others hire staff or outside companies to take care of that aspect of their lives. Some examples of those who handle their own media: LLCoolJ, James Woods, Paula Abdul and Kaley Cuoco. Examples of those who have outside people handle their account are: Megan Hilty and and Shania Twain. Other celebrity accounts are difficult to nail down. Sometimes it appears posts are from the celeb themselves and other times it feels like it's someone else. LLCoolJ - 5M Twitter followers; James Woods - 1.6 Million Twitter followers; Paul Abdul - 2.1 Million Twitter followers; Kaley Cuoco - 3.8 Million Instagram followers (even though she uses a fake name); Megan Hilty - 87.8K Instagram followers and finally, Shania Twain - 826K Instagram followers and 900.1K Twitter followers. With those kinds of numbers, it would be rare for you to really "get to know" the celeb in question. Anyway, that's it for this week. Not on Social Media yet? It's a big world out there and it might be time to jump in!